For those keeping score, it is not warm yet in NYC. As we wait ever so patiently (read: not patiently at all) for the longest winter ever to come to a close, the days of the week are getting curiouser and curiouser. They’ve been plagued with stomach bugs, workdays when you feel like you just can’t win, disappointing conversations, and harsh, reality-busting realizations. Luckily, the days have been conversely peppered with personal productivity, international travel plans, 30 Rock marathons, and insanely late weeknights traipsing around Manhattan because adulthood and #yolo. After a weekend of both low lows and high highs, I couldn’t think of a better way to start the week than with a sweet and simple cake. The original recipe calls for the addition of cocoa powder to the batter, but I don’t prefer chocolate cake so I eliminated that element and added chocolate chips instead (Molly made the real version!). This cake is a really easy crowd pleaser (ask anyone in my office, they reaped the benefits of my Monday night baking), and is just as good completely plain as it is with strawberries and cream. It also makes for a great dessert, or even breakfast with coffee. AND it’s vegan if you sub the whipped cream for coconut cream. *I enjoy the depth olive oil brings to a cake. For a more subtle flavor, sub in vegetable oil. Preheat the oven to 350 degrees. Grease 2 cake pans and set aside. If you don’t have a cake pans (like me for some odd reason), a square, rimmed pan works as well, and you can slice out individual cake squares that way. In a large bowl, combine flour, sugar, baking soda, and salt and sir until mixed thoroughly. Make a well in the center of the dry ingredients and add olive oil, vanilla extract, vinegar, and water. Using a whisk or a wooden spoon (guess who doesn’t have a whisk in their apartment?! This girl. #amateurhour), mix wet ingredients with dry ingredients until a smooth batter is formed. 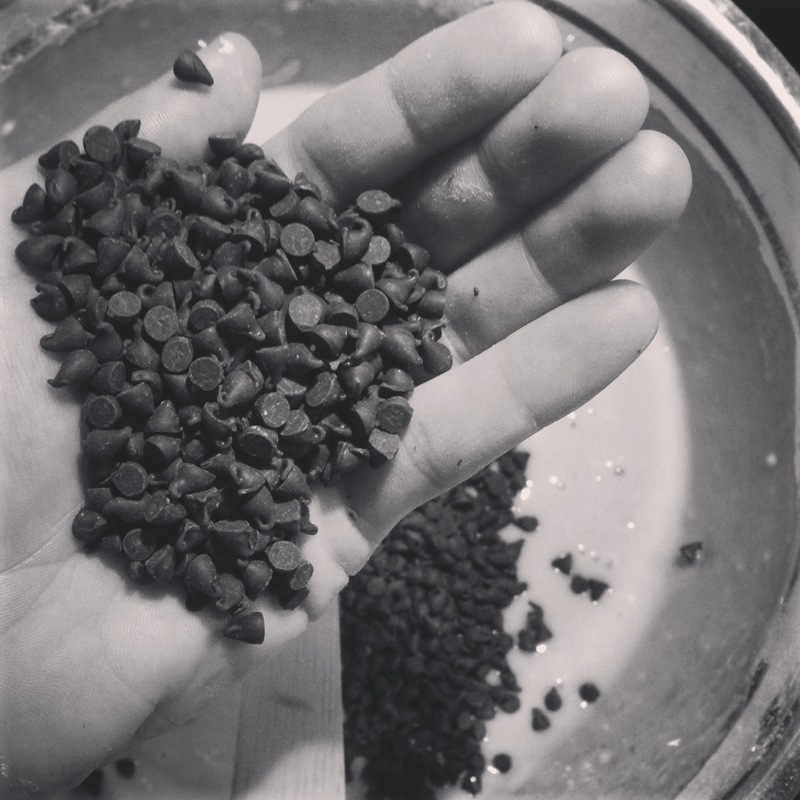 Fold in chocolate chips until consistent throughout. Pour the batter into the cake pans or square pan and bake for 30-45 minutes, or until a toothpick comes out clean. Allow to cool completely. While the cake is cooling, whip heavy cream into soft peaks in a medium bowl. Add powdered sugar and vanilla until incorporated and slightly stiff. If your cakes are round, slice the domed top off one of the cakes to make a flat surface and place on a serving tray. Top with whipped cream and place a layer of strawberries on top. Top these layers with the second cake round, add whipped cream and strawberries. Slice and serve. If your cake was baked in a square pan, slice the cake like you would a lasagna. 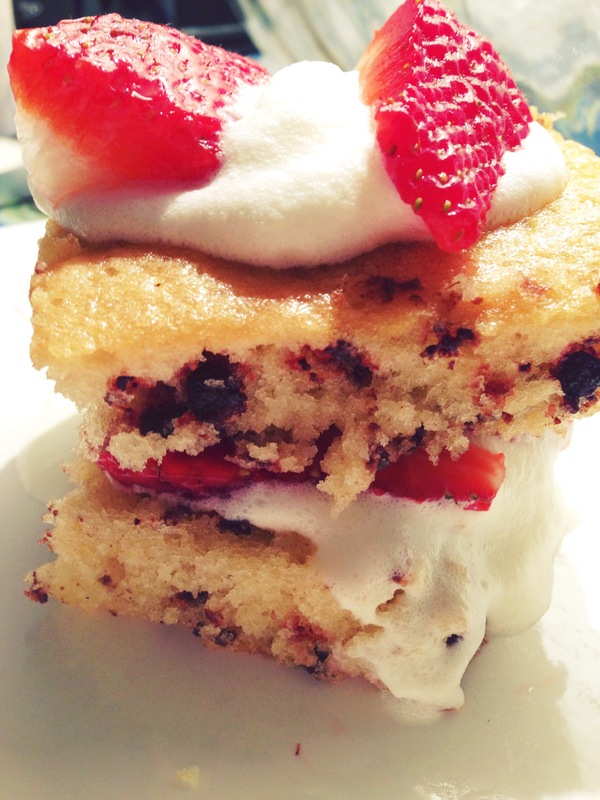 Split the square in half, add whipped cream and strawberries, top with other half. Add extra strawberries and whipped cream to the top. Proceed to inhale. handful. it’s a technical term. Subscribe to Ready to Salivate and receive notifications of new posts by email!